I used to love Fourth of July fireworks. Until I had a dog that was out-of-her-mind terrified of them. When my sweet, gentle Golden heard fireworks, gunshots or thunder, it sent her into a frantic frenzy where she would either run or try to dig or chew her way out of whatever room she was in to get away from the noise. She tore up carpeting, chewed through door frames and drywall, and broke more than a few teeth doing it. A frightened dog can run away, bite, or act out with destructive behavior. 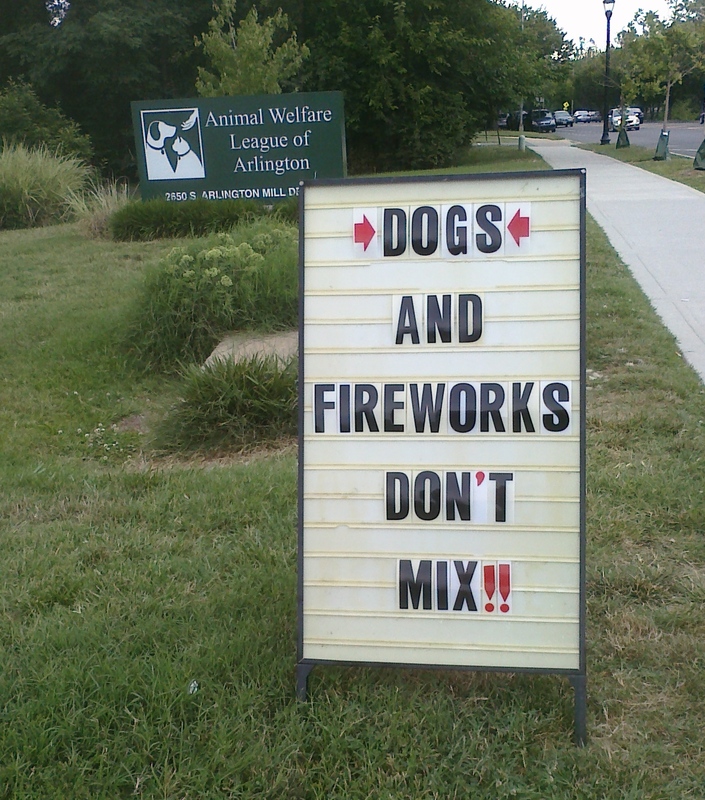 The kindest thing you can do for your dog during Fourth of July festivities is leave them at home. Some signs that your dog is fearful of loud noises include panting, pacing, howling, shivering or shaking. If they are showing some of these signs, talk to your vet before it escalates into destructive behavior. Your vet can recommend things you can do to ease your pet’s fear. 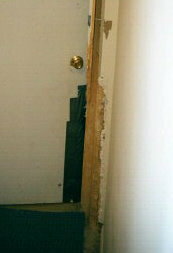 Damage done to a door by a dog scared by nearby fireworks. Some of the things I tried over the years with my vet’s support included the anxiety-reducing prescription drug Valium; the homeopathic flower essence remedy Rescue Remedy; the hormone supplement Melatonin; acupuncture; and behavior-modification techniques like playing a CD of thunderstorms at low volumes while rewarding her with treats. Other treatments include aromatherapy in the form of collars and air freshener-like plugins that emit calming pheromones, and pressure-point garments such as the Thundershirt™. Do your pet and yourself a favor by making sure your pet is safe in a calm, comfortable place during Fourth of July holiday celebrations.